I tried this once before, now it happened again for 4-5 pages, two of which had good traffic. Pages simply get deindexed. No message, no nothing. Just not indexed anymore. I've submitted an updated sitemap, hopefully that fixes things. Funny you mentioned this. Today I noticed that one of my pages seemed to be de-indexed. Double checked in Wordpress to make sure I hadn't changed any settings, and was all good. But the page wouldn't show up in Google even if I did a "site:search". However, in Google console it says the page is live and indexed. No manual actions against the site. And when I checked Serpwoo it showed that article is still ranking for terms. So not really sure what's going on. Figured it might be a problem with Google so will give it a couple days. It might be a bug, several "Masters of the Web" are reporting the same thing: Google Is Dropping Pages Out Of The Search Index; A Bug? I think you guys worry too much about minute details of Google. Is the traffic decreasing for the page? Just checked and noticed a few strong pages from my main site are totally deindex - wtf. Is the traffic decreasing for the page? There was no traffic, because the pages were deindexed. They're back again now, after sitemap and asking to be included. Was there traffic before the page was de-indexed? If so how much? I think Google’s A.I. is kicking in, but I have no hard proof. I think they're merging pre processed indexes, and pre processed clean up templates and rolling back as issues present themselves. Machine learning as I understand it works better for constructing indexes and using them reference values than real time practical application to the "algorithm". Possibly acknowledging a bug, and solution to fit it. I was able to immediately re-index one of my de-indexed URL’s using the index URL feature in GSC - which has returned the page to its normal #3 ranking position. Now I just need to go through all my URL’s to see how many are affected. 2 out 3 pages had "a lot" of traffic, relatively speaking. Both were popular pages, which frequently got social shares. I would consider both "strong" pages context and content wise. Unique content, original research, informative. Very un-Google like. Maybe James Damore was on to something. My biggest moneymaker page was affected by this 2 days ago, I was away and just noticed it in my serptracker now. Out of 180 pages on my site, just my biggest page which was #1 for featured snippet then #1 organic result, dissapeared. I just submitted a sitemap and ran the Url inspect tool, and live inspect...hope it comes back, hope I get the featured snippet back will update but clearly the comment from google about it being fixed is false. Just to update everyone on this, as Barry posted above, Google said they got this fixed up. But apparently the problem is now cascading to Search Console's Coverage dashboard, Enhancement reports, and the URL Inspection tool. 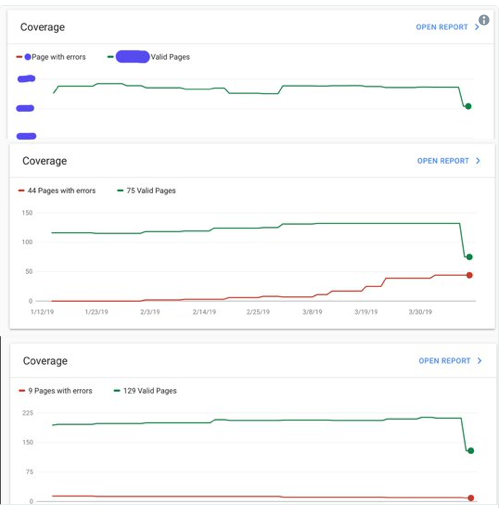 Apparently Coverage is reporting issues that are otherwise fixed in the SERPs and the URL Inspection tool is also reporting the incorrect data. Google on Twitter has "Search Console is still recovering from the indexing issue" but that the important part is that it's actually fixed in the SERPs. Google is "investigating a new indexing bug" related to Google News sites. Same exact issue but limited to Google News and "only impacting a limited number of publishers." I thought you should know that if you're a Google News publisher. Have fun! As I said, maybe Damore was right. Hiring on anything other than merit will eventually lead to decay. Google has been hiring on political criteria for years now. I can almost hear the competition revving their engines. The invulnerable beast shows weakness for the first time in 10 years. What's killing me about this is that Search Console's coverage report hasn't updated in 16 days now and counting. I guess they paused it until they have this sorted out and are probably trying to fix the messed up data too.